Software removes the clutter, jargon and confusion from the Internet. Allows the people who know you best to add the things you love, even when you aren’t with them. Human help when you need it. What you can do with Breezie? Breezie comes loaded with plenty of easy-to-use in-house services (also known as applications) such as the Start Screen, your personal Address Book and Breezie Mailbox – where you’ll find all your email. It’s easy to add extra services, and many of them are free to add and use. We also work hard to research and curate our list of applications that are particularly suited to Internet novices to help them get off the ground. We try to ensure that these are as easy as possible to use and are advert-free. Breezie makes using a tablet computer simple and easy. Breezie comes with plenty of built-in services and applications already set up and presented in a unique, user-friendly way. Breezie lets you use simplified versions of everyday services and applications like Skype and email – making it easier than ever to keep in touch. Breezie can do anything a standard tablet does, but strips it all back to intuitive, user-friendly basics. Find out more about what you can do with Breezie. 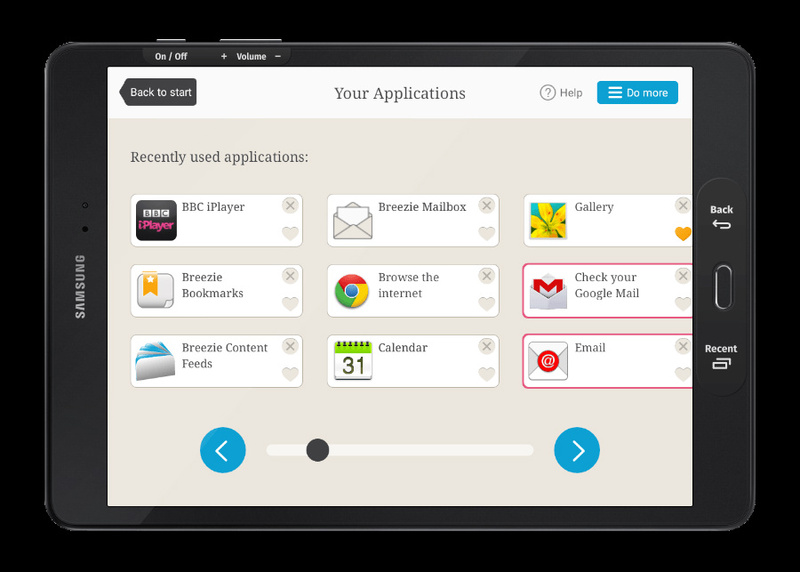 Breezie takes away all the complications of setting up a new computer or tablet. Everything is fully personalised to suit your needs before it’s sent to you – so when you receive it, you can just switch on and get going. We create the accounts you need and add bespoke content and services based on your interests, hobbies and pastimes. We also provide a unique facility which lets a trusted family member or friend further personalise your Breezie for you.